Newburgh Free Academy Boys Varsity Basketball team took on Monroe Woodbury on Thursday, January 8, 2009 at Newburgh Free Academy in Newburgh, NY. NFA defeated Monroe Woodbury 65-54. 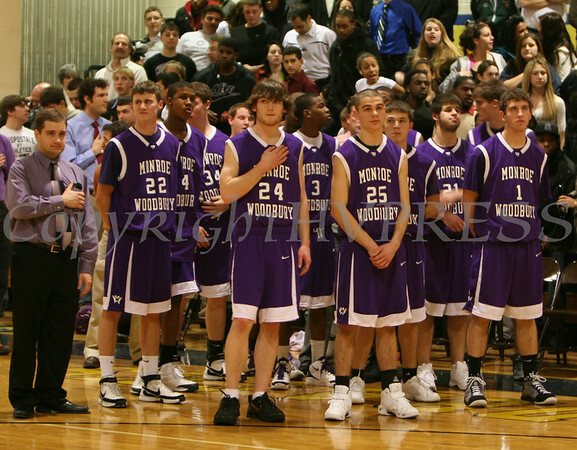 Monroe Woodbury players stand during the singing of the National Anthem prior to their game against Newburgh Free Academy on Thursday, January 8, 2009. NFA defeated Monroe Woodbury 65-54. NFA defeated Monroe Woodbury 65-54.